Continuing with our excerpts, here is an article about the great editorial cartoonist Homer Davenport. 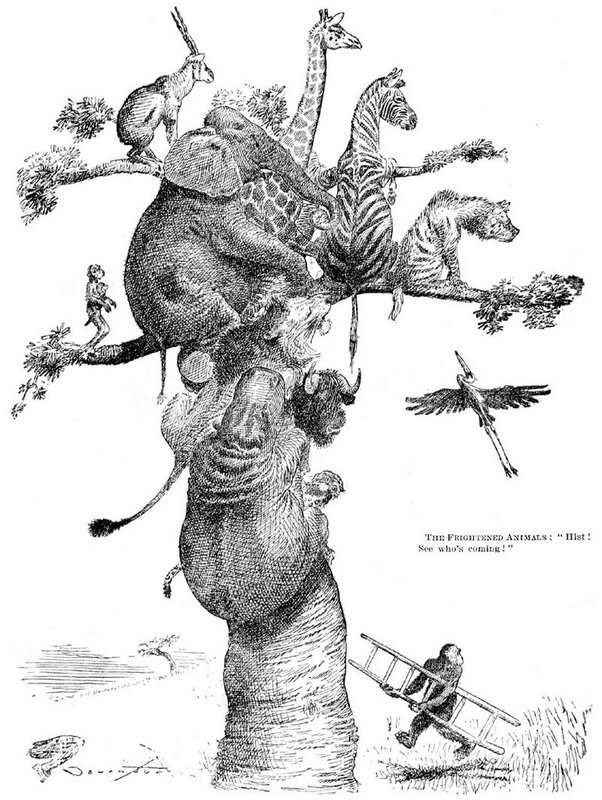 The subject of our sample Davenport cartoon is Teddy Roosevelt (who was an avid big game hunter). Rebuffs and Disappointments Fail to Repress a Great Cartoonist's Genius. 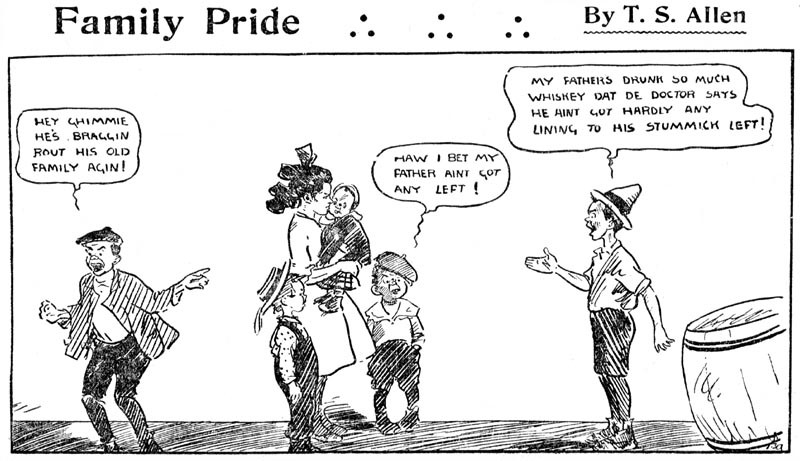 To-day Homer C. Davenport is the "first cartoonist" of America, and yet he is but thirty-five years old. Mr. Davenport has a small place in Roseville, on the outskirts of Newark, New Jersey. He is a tall, handsome man, with large, humorous eyes, beneath heavy eyelids, that give him an expression of perpetual thought. "I suppose you want to see my studio?" Mr. Davenport said. We went upstairs. "This is it," he said, with a chuckle. It was merely a small, square room, with a few framed pictures on the papered walls, and a desk in the corner. There was no easel in the room, but I saw a drawing-board under the desk. "You work on that board, when on the desk?" "Yes." "You are disappointed," said his sister, with a smile, “It is not what you expected." It wasn't. I had expected to see a typical studio, with unfinished cartoons, and the usual artistic surroundings. "Tell me of your beginning," I said. "Well, I was born in Oregon, thirty-five years ago, on my father's farm. As a child, I was perpetually drawing, and to my father I owe much, for it was he who encouraged me, my mother dying when I was very young. I would lie flat on my stomach, and draw on the floor, if I had no paper. As I spent hours this way, the habit became injurious to my digestive organs, so a flat cushion was made for me. I was a hopelessly poor student, doing more drawing on my slate and on the margins of my books than studying. To sit in school for any length of time made me sick and nervous, so my father called on the schoolmaster and gave instructions that, whenever I got tired, I should be allowed to draw, or to go home." "This was rather demoralizing to the school, for even then I drew cartoons. Finally, I was taken away, and my father painted a blackboard, .four feet high by fifteen feet long, on the side of a room in the farmhouse, where, with plenty of chalk, I drew to my heart's content. I would draw all day." "And you received no instructions in drawing?" "I never had a lesson in my life. It was my father's ambition for me to become a cartoonist. When, in later years, I did anything that he considered particularly good, he would carry me off to Portland, and I would submit it to the Portland 'Oregonian,' where my attempts were always laughed at. Then, much crestfallen, I would return to the farm." "Now, my boy,” my father would say, “that is good. enough to be printed,” and off I would go again. "At length, the news spread that I had a job on the Portland 'Oregonian.' The whole town became interested, and when the day arrived for my departure, the band of which I was a member, and many of the townspeople, escorted me with due honor to the railroad station." "I was on the Portland 'Oregonian' just one day. " 'What's the sense of this?' I was asked. 'You can't draw,' and back I went. "I had before me the mortification of meeting the righteous disgust of my friends. On my way back to Silverton, I heard that they were short of a brakeman at the Portland end, so I beat my way back to Portland, and, walking into the office, offered myself. "'What!" said the man. 'What do you know about braking? I would like to know who sent you on such a fool's errand?' and he raved and stamped, and swore he would discharge everyone on the train. But on the next train, I went out as head brakeman. All the elements got together, -- it rained and snowed and froze, and when I got to Silverton, almost frozen, I slipped from the train and tramped home, a much disheartened young man. "But just to show my father I had something in me, and wanted to make my way in life, I asked to be sent to an institution of learning, where I stayed just one week. Then I got a place attending to the ink roller in the local printing office, where the town paper was published, which, to this day, I do not think can be beaten," and Mr. Davenport laughed in his hearty way. "Finally, my star rose on the horizon. I went to San Francisco, and was taken on trial on the 'Examiner.' I remember the day well, February 8,1892. For one mortal week, I simply hung around the office. Then I was put to work at ten dollars a week. But I proved unsatisfactory. I drew the man over me aside.
" 'Look here,' I said, 'I can't draw. I want you to write to my father and tell him what a failure I am, and that his belief that I am an artist is the delusive mistake of a fond parent. He sat down to write, and, as he was doing so, my fingers, always itching to draw, were at work with a pencil in sketching horses, on a piece of paper on the table.
" 'When did you do that?' he asked, picking up the paper. "I did it just now," I replied, sheepishly. "I did so. He looked at me curiously.
" 'Davenport,' said the manager, 'you are too old to strike a path for yourself. You must put yourself in my hands. Do nothing original, not one line.' If the manager caught me doing so, he tore it up. "I remember one time, Ned Hamilton, a star writer on the 'Examiner,' some others, and myself, were sent to a Sacramento convention. I drew what I considered very good likenesses, and that night, when I retired, with a fire burning brightly in the room where we all bunked, I fairly kicked my heels in delight, in anticipation of the compliments of the 'Examiner.' I was awakened by the tearing of a paper, that sent the cold shivers up and down my back. Ned Hamilton was grumbling, and throwing my labor into the fire. "I almost wept, but it took any conceit I might have had out of me, and the next day I did some work that was up to the mark." "But my walking papers came in due time, and I went to the 'Chronicle.' It almost took my breath away when they offered me twenty dollars a week. Before I was discharged from there, I had risen to a higher salary. I went to Chicago, and got on the Chicago 'Herald,' at thirty-five dollars a week. I was there during the World's Fair. It seemed to me the principal thing I did was to draw horses. But the greatest blow of all was when the Chicago 'Herald' discharged me. It seemed as if everything were slipping from beneath my feet. I went back to San Francisco and got on the 'Chronicle' again. It was then, and not till then,-1894:,-that I was allowed any freedom. All that I had been asking an outlet for found vent, and my cartoons began to attract attention.
" 'Oh, we bounced him; he's no good,' was the reply.
" 'Send for him!' said Mr. Hearst. "No attention was paid to the order. Mr. Hearst finally sent for me himself. I was engaged at forty-five dollars a week. Then a thing happened that I will never forget, for no raise before or since ever affected me to such a degree. "I drew a cartoon of Senator 'Steve' White and his whiskers. The whiskers so pleased Mr. Hearst, that he called me in and said that my pay would be raised five dollars a week. I went home that night, and woke up my wife to tell her the glad news. She fairly wept for joy, and tears trickled down my own cheeks, for that increase meant appreciation that I had been starving for, and I felt almost secure,-and all on account of Senator 'Steve' White's whiskers." "Yes, no subsequent increase, no matter how large, has ever equaled that five-dollar advance." Mr. Hearst, as soon as he bought the New York "Journal," telegraphed to the "Examiner:" "Send Davenport." He is now receiving a very large salary, and his work is known throughout the world. Two years ago, Mr. Davenport went abroad and drew sketches of the members of the houses of parliament, and Mr. Phil. May, the English artist, became his fast friend. Such is the man and artist, Homer C. Davenport, who, in 1894, had not drawn a public cartoon, and who, to-day, has a world-wide reputation, and the esteem of even those whom he has caricatured, and who cannot help enjoying their own exaggerated portraits. Davenport's success has come rapidly, but not until he had sustained reverses that would have discouraged any man of a less resolute character. This is a great interview. Davenport of course is at his self-depreciating best here. For example, he actually worked for the Oregonian for about four months! Continuing our excerpts (see previous post). Sample above is a typical T.S. Allen Just Kids cartoon. One of the artists whose purpose in life seems to be smile-breeding is T. S. Allen. Well known in connection with his work in the columns of the New York American, his studies of and contingent jokes on "tough" youngsters under the caption of "Just Kids" are full of genuine humor. Mr. Allen was born in 1869, in Lexington, Kentucky, and was educated at Transylvania university, of that state. After some years spent in writing jokes, jingles, etc., for local and New York newspapers, he began to illustrate the same in a manner which quickly caught the attention of editors. To-day he has an established reputation as a graphic humorist, and his work finds a ready and remunerative market. In the world of illustrators, the man who can originate an idea which excites the laughter and holds the attention of the public is indeed fortunate. Such an individual is R. F. Outcault, the artistic father of the "Buster Brown" series which appear in the Sunday New York Herald. He is also the author of the "Yellow Kid" and "Hogan's Alley" pictures of the Sunday New York World, and of equally laughable creations in the New York American and other publications. Born in Lancaster, Ohio, January 14, 1853, he was educated in that town. In 1888 he secured a position with Edison, and went to Paris in the inventor's employ. Returning to this country, he illustrated for some time with a fair degree of success, but it was not until 1894 that he made his first distinctive hit as a comic artist. Mr. Outcault's personal description of his daily life is interesting. He says: "I have flowers, a garden, a dog and a cat, good music, good books, light stories, draw pictures, smoke a pipe, talk single tax theories, am a member of a couple of clubs, lead the Simple Life." Humor, strenuous and wholesome, marks the work of Carl E. Schultze. His name is literally a household word in this country by reason of that quaint conceit, "Foxy Grandpa," of which he is the creator. He was born on May 25, 1866, Lexington, New York, and was educated in the public schools of that town and at Cassel, Germany. On his return to America he studied art under Walter Satterlee, of New York. For some time later he seems to have been undecided as to how to apply his gifts, but an accidental sketch submitted to a Chicago paper, resulted in his being forthwith engaged by that publication. After remaining in Chicago on several newspapers for some years, he took a trip to California, doing further artistic work in San Francisco. At length he determined to beard the metropolitan journalist lions in their dens. After a struggle, during which he did work on Judge and other New York publications, he became a member of the staff of the Herald, where, thanks to an accidental inspiration, "Foxy Grandpa" came into existence. Later he became connected with the New York American. Mr. Schultze is a man of magnificent physique, and is held in high esteem by those who know him. He is the author of several works of comic drawings, and "Foxy Grandpa" has been dramatized. Eugene Zimmerman's cartoons in Judge are characterized by an insight into the political questions of the hour which is assisted rather than hindered by the sheer humor of his work. He was born at Basel, Switzerland, May 25, 1862. While yet a baby his parents came to the United States and settled at Paterson, New Jersey, where he received his education in the public schools. After leaving school, he was in turn a farmer's boy, an errand boy in a store, a fish peddler, a baker and a sign painter, but sketched and drew continuously. In 1882 he secured a position in the art rooms of Puck, and after doing considerable work for that publication left it in order to join Judge. He has also illustrated books and articles by Bill Nye and James Whitcomb Riley. As a caricaturist pure and proper he is almost without a rival in this country. A short while ago I saw a book advertised on eBay that contained some capsule biographies of great cartoonists. I procured a copy, which turned out to be two book set, and thought I'd pass along the relevant bits (only about fifteen pages of material). The cartoonist photos, though small, are a great find because I've never seen a few of these guys photographed before (T.S. Allen, for instance). 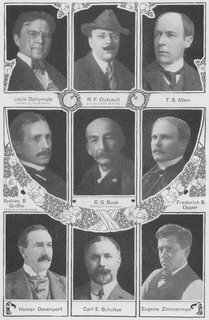 Most of the bios are quite terse, but in parts 3 through 5 of this series we will get extended articles on Charles Dana Gibson, Homer Davenport and Frederick Burr Opper that offer some real insights. So here is part I of excerpts from Little Visits With Great Americans, or Success Ideals and How to Attain Them, edited by Orison Swett Marden and published by The Success Company in 1905. Charles G. Bush, the cartoonist of the New York World, is an example of success achieved comparatively late in life. His early work consisted for the most part of magazine illustrations of a serious nature. After studying in Paris, under Bonnat, he, on his return to America, endeavored to follow a career of painting, but fate willed it otherwise. In 1895 Mr. Bush drew a cartoon in which David B. Hill was the principal figure. The New York Herald accepted the picture, and the next morning Mr. Bush woke up to find himself famous as a cartoonist. From thence on his career has been one of more or less constant successes. Louis Dalrymple, the illustrator and cartoonist, was born at Cambridge, Illinois, January 19, 1861. After receiving a common school education, he entered the Pennsylvania academy of fine arts, graduated from it with credit and later studied at the art students' league of New York. Subsequently he branched out for himself and began to submit drawings to the metropolitan comic publications and newspapers. Work of this kind secures immediate recognition for an artist who can comply with the public demands of the moment. Mr. Dalrymple being not only clever but shrewd, it came about that within a very short time he was kept busy in executing commissions. His work is characterized by a delicacy and acumen that prove that he thinks as well as he draws. When the modern daily newspaper began to add to its news columns the so-called supplement, there was a coincident demand for artists who had the gift of humor. Sydney B. Griffin was one of such, and for some years past his supply of unique ideas seems to have been inexhaustible. He was born October 15, 1854, of English and Scotch parents, attended public schools at Detroit, Michigan, and, in 1888, came to New York. When his first ideas were presented to Puck they were declined, but upon his taking them to Judge they were accepted forthwith. Mr. Griffin took the trouble to inform the Puck people of his success with their rivals, whereupon he was told that his work had been refused for the simple reason that it was so excellent that it was feared that it was not original. However, Puck made the amende honorable by engaging him forthwith. Mr. Griffin's style is bold and slashing and his drawings are full of point and power. Bronc Saddler, The Rodeo King by Del and Herb Rayburn, writer and cartoonist respectively, ran just one year (1/14/51 - 1/6/52) from the New York Post Syndicate. The Post had a pretty good line-up of strips, but they just couldn't seem to sell them to many papers. This feature, entering a market that was already glutted with cowboy strips, didn't have much of a chance even though both the art and the writing were quite good. 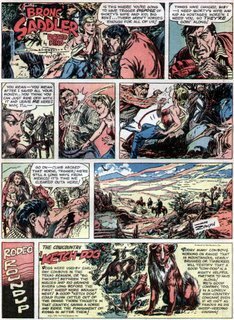 I don't know much about the Rayburns, but Del had written some western fiction for the pulps and produced a booklet titled The Rodeo Kings just before starting this strip. Herb Rayburn, whose art style on the strip was strongly pulp-influenced, went on to do some art for kid's books. Far more rare than the Post Syndicate run of the strip is a second run that ran in the ultra-rare Arrow Comic Weekly comic section. This preprint section, apparently marketed mainly to small weekly papers, is so rare that a complete run of it has not yet been found. Jeffrey Lindenblatt has indexed the only partial run we've ever found, in the Manhasset Press. I have a total of just one incomplete section in my own collection. Bronc Saddler ran in this section from 10/29/53 or earlier until 12/17/53, this time credited to William Allison. My guess is that the name is a pseudonym for the Rayburns, but not having seen with my own orbs a single example of this strip in the second run I can't even make a guess on that count. Allison was going to be the Harry "A"
William Merle Allison according to Jerry Bail's Who's Who and the askart.com site was born in 1880. 1934 and the other in 1946. So whether it is an alias on the 1953 Bronc Saddler is still a guess. Hi DD. I think there's a much better chance that it is a pseudonym for the Raybuurns. First, they had the copyright on the strip in the first run, and it certainly wasn't such a hot property that someone would be likely to buy the rights. Second, the name William Allison could very well be a combination of two old West gunslinger names - William Bonney (Billy the Kid) and Clay Allison, making it an excellent pseudonym for a western strip. I have one and and came here to find some more info. I picked it out of my pile of stuff because it has a 1953 Bruce Gentry strip on the front, signed by Scap (?) in a faux Ray Bailey style. Possibly a restart of the strip because of the succes of the movie serial? I will scan the whole thing in and give it some attention next week. Where can I acces the index by Jeffrey? I am slated to write an article for the next Hogan's Alley about the Arrow Comic Weekly. I'm anxious to see your section since they are really, really rare! Mine's from a differet paper than the one you mentioned. Possibly one more route to find copies or microfiche rolls? Eh... the name escapes me now. I'd have to go upstairs and have a look. I looked up mine. It's a Walden paper from 1953-11-26. I can't make out the date on your sample, but it seems one year earlier with it's 11-18 date. On my Stright Arrow page is a number 5 in one of the first panels. Other strips are Debbie Dean, Gulliver's Travels, Bronc Saddler, Bruce Gentry and Son of the Buccaneer. The paper is The Walden Citizen Herald, which seems to be still in business. at least the Library of Congress mentions some libraries holding the relevant years... so they may still be out there! I am almost ready to put my scans up. With Bronc Saddler, Bruce Gentry, Straight Arrow and Debbie Dean we have for strips that were discontinued earlier, but restarted for this paper insert. Son of the Buccaneer seems like foreign strip and Guliver's Travels is by Funnies Inc, so it could be the Classics Illustrated version. And then there's the sf strip Galaxywhich I am still looking for. just a note that William M. Allison was a regular on westerns for Jacquet. And certainly the style is similar - someone could compare more examples than i did to determine if it is the same Allison. I have found what seems to be all eight Arrow sections on fultonhistory.co, a site that speecializes in in New York State papers. They start on October 29 1953 and run to December 17, with no new section on December 24 or 31 (even though in the last one a Scroogle adaptation is started that is supposed to be continued in the next issue). Hi I have artwork that was drawn by herb and wanted to know how to contact his family. Would u have that info or know how I can get it? I have finally come around to using the Arrow scans I have on my blog. I am putting them up starting from tomorrow, all eight of them. Interesting that my dates are the same as the ones you mention, which makes me wonder what the reason is for mention uncertain dates. As far as I can se it, it just ran for eight weeks. Lieutenant Richard Rick (yup, that's really the name) wasn't any great shakes as an artist, but his art is head and shoulders above his writing ability. 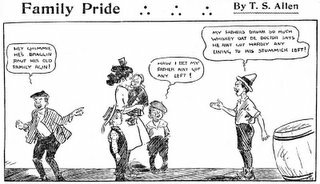 Rick's comic strip, Wiley of West Point, is the low point of the boy cadet genre that was popular in the first half of the 20th century. Sitting here looking through samples of the strip, I was searching for one to scan for this post. I had to look through dozens before I found one that had intelligible dialogue and conveyed some bit of a plot. The more typical strips are written in what I suppose Rick thought was snappy patter, but comes out as complete gobbledegook. The plot plays out in fits and starts, often hurtling ahead at warp speed with no regard for exposition - the reader is often left having no idea what's going on. I'll not belabor the point much further, but one must wonder why Bell Syndicate would try to sell this material to newspapers. Practically the only paper I know of that ran it was the Brooklyn Citizen, and they only did so because they were at the low end of the New York City comic strip totem pole (exclusive contracts made it very hard for smaller New York City papers to get comics). That paper, indexed by Jeffrey Lindenblatt, provides us with the only known run, which is 3/4/1935 through 1/4/1936. Have you seen this strip anywhere else? Although locally produced features are few and far between, one niche for local cartoons has long been popular. The phenomenon of Ripley's Believe It or Not spawned not only dozens of syndicate-produced competitors (Strange As It Seems, This Curious World, According To Guinness, Our Fascinating Earth, etc.) but also many locally produced versions detailing the history and curiosities of the area served by the newspaper. 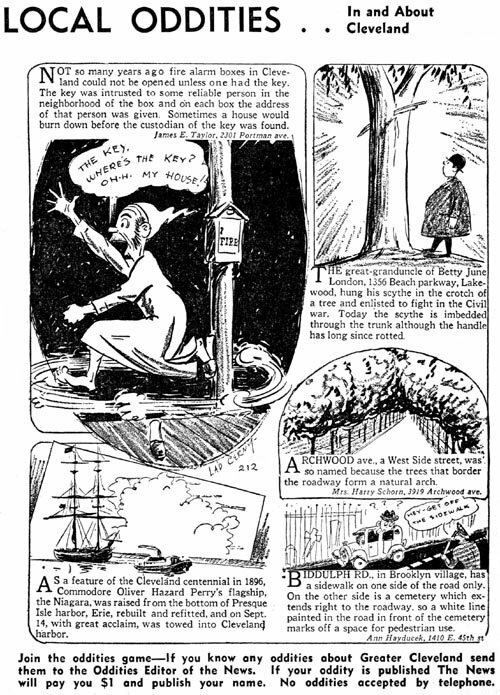 Local Oddities, produced for the Cleveland News, is fairly representative of the genre. 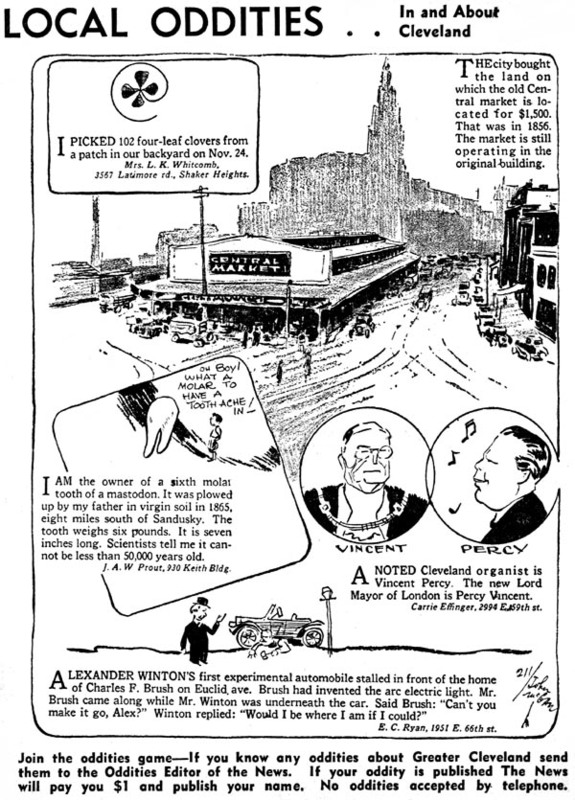 It began in April 1935 and lasted at least though 1937 and perhaps much longer (I have not indexed the Cleveland News as yet - the dates are based on my scattered samples). One interesting aspect of Local Oddities is that it was produced in tag-team fashion. Two cartoonists, Lad Cerny and John McGaw, would switch off on the art duties from day to day. Also notable is that the panels were numbered, but our two cartoonists apparently didn't communicate too well because they continually mess up the numbering system. Local features are an Achilles heel for Stripper's Guide since they are so hard to find and track. If you have information on local strips and panels I'd love to hear from you with any information you can pass on. 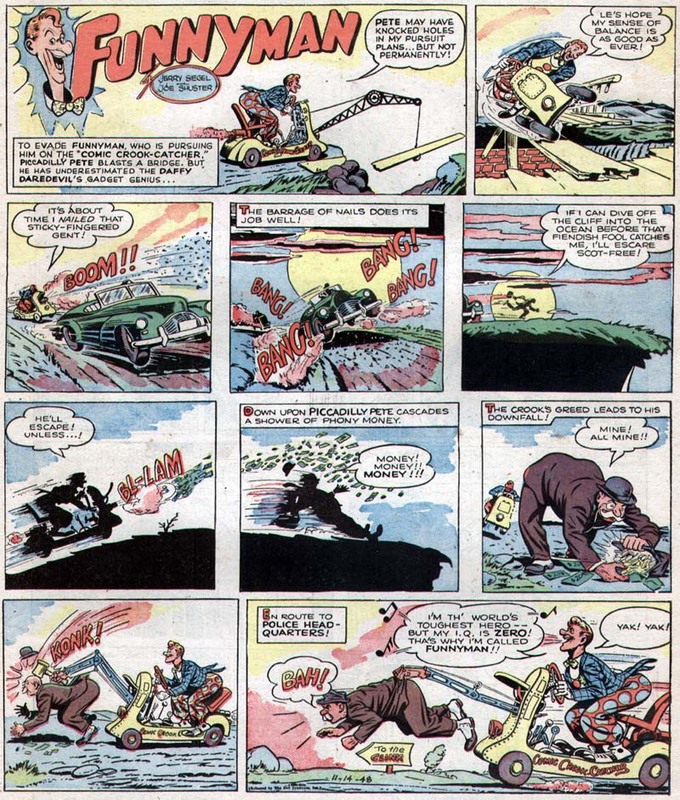 Jerry Siegel and Joe Shuster, the team that created Superman, took a stab at creating a second phenomenon in 1948 when they unveiled Funnyman to a public that let out a collective yawn. The character, who started life in comic books, was a goofy comedian who dressed up as sort of a superhero and fought crime with lots of yocks along the way. The concept of a humorous superhero had already been done before and done better (Jack Cole's Plastic Man coming to mind). 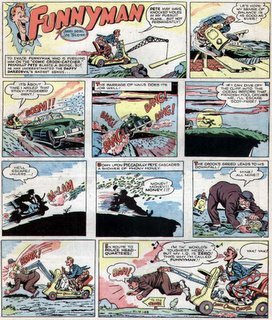 The comic book version of Funnyman lasted just six issues, but inexplicably the concept, now a proven loser, was picked up by Bell Syndicate to run as a newspaper comic. I guess Bell believed that Funnyman would appeal more to adult newspaper readers than the comic book reading kids. Turns out that Bell Syndicate was wrong. The strip, which started on October 11, 1948 (just as the many unsold copies of the comic book's last issue were being yanked off newsstands) intially had few clients and things went straight downhill from there. The strip was both a daily and Sunday -- the Sunday ran in very few papers and the daily was practically nonexistent. In June 1949 some genius apparently decided that the whole problem with the strip was that goofy Funnyman guy, so the character was dropped from the strip (at least from the Sunday - I haven't found any dailies that late in the run). The strip limped along awhile longer, now completely and utterly directionless with no title character in evidence. My last example of the Sunday is dated October 9 1949, and I'm guessing that was the last installment. Has anyone seen any later, and does anyone know when the daily ended?